I strongly suspect that the main reason why AFTER THE SUNSET was filmed was so that the cast and crew could have one hell of a working vacation in The Bahamas. The movie was filmed on Nassau and New Providence Island and showcases the gorgeous Atlantis Hotel and Resort. The movie makes The Bahamas look so beautiful and so much fun that halfway through the movie I wanted to shut it off, wake up The Wife and go book a flight down there right away. Which is part of the problem with AFTER THE SUNSET. You’re so busy looking at the gorgeous scenery and the cast enjoying it so much you’re really not paying much attention to the story. And with a killer cast like Pierce Brosnan, Salma Hayek, Woody Harrelson, Naomie Harris and Don Cheadle you would think you’d be on the edge of your seat savoring the remarkable acting talent on the screen. You won’t and I’m willing to bet you won’t even care. 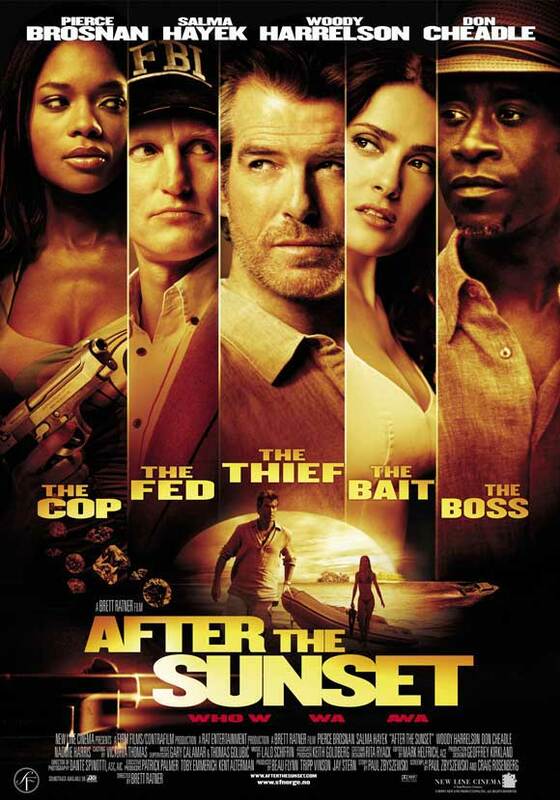 AFTER THE SUNSET is such a lightweight movie and it’s obvious that the cast aren’t even going deep into the bag of acting tricks that they’ve all proved in the past they’re more than capable of. There are no heavy performances in this one and no big scenes. AFTER THE SUNSET is as amazingly laid-back movie with no more substance than cotton candy and it’s a movie you’ll be hard pressed to remember three days after you’ve seen it. But while you’re watching it you’re enjoying what you’re seeing. Max Burdett (Pierce Brosnan) is a Master Thief of the old school. He’s never been caught and his trademark is that he always has an absolutely unshakeable alibi. Matter of fact, Max always has concrete evidence that he was somewhere else whenever a heist was pulled. Max’s latest heist involved stealing the second of three large diamonds once owned by Napoleon. Max has already stolen the first. The second diamond is being guarded by ace FBI agent Stan Lloyd (Woody Harrelson) but Max is able to steal the diamond right out from under his nose with almost ridiculous ease that makes Stan the laughingstock of the FBI. Max and his gorgeous lover/partner Lola (Salma Hayek) head off to The Bahamas for a well-earned retirement. Stan has been suspended and his career is on the verge of the abyss. On his own he tracks them down because Stan knows that the third Napoleon diamond is on a cruise ship heading for The Bahamas and he knows that Max knows. And Max knows that Stan knows that he knows. And Lola knows that Max knows that Stan knows that Max knows. You see, Lola doesn’t want any part of the heist. She honestly wants to retire and give up boosting ice. But Max has a clever scheme to get both Stan and Lola to help him steal the diamond and the best part of it that the two of them won’t even know it. It’s driving poor Stan crazy trying to keep one step ahead of the wily Max, even with the help of local police detective Sophie (Naomie Harris) who has her own problems trying to put local crime boss Henri Moore (Don Cheadle) behind bars. But seeing as how Henri and Max enter a partnership because Max is going to need Henri’s island contacts to steal the diamond, she agrees to team up with Stan to get the goods on both of them. But that’s also a problem with AFTER THE SUNSET: it switches gears so fast that you’re never able to get comfortably into a mood. The romantic scenes between Pierce Brosnan and Salma Hayek are either full of steamy sexual energy or seem as if the screenwriters are using lines and gags stolen from “I Love Lucy” reruns. The heist scenes are either full of action and tension as any of Brosnan’s James Bond movies or so incredibly devoid of any common sense and logic you wonder if Max Burdett studied under Wile E. Coyote. The scenes with Brosnan and Woody Harrelson are either deadly serious as when they’re pointing guns at each other in a John Woo type standoff or completely slapstick as when they’re on a boat fishing and catch a shark. What happens next wouldn’t be out of place in a Martin & Lewis comedy. Brett Ratner isn’t exactly one of my favorite directors as I absolute detest the “Rush Hour” movies and well made as it was, “Red Dragon” was a totally unnecessary film. He’s all over the place here, never settling down for more than a minute as if he figures we would get bored if the movie was an out-and-out heist thriller and threw in as many elements as he could to keep things jumping. I’ve got no complaints with the acting. As I’ve said earlier, everybody in the cast looks like they had an absolute blast making this movie and it comes across on the screen. And it’s worth watching just for the supernaturally beautiful Salma Hayek. She looks so good in this movie it made my toes tingle. I know women who have said that they’ve never thought about being a lesbian but Salma Hayek could make them change their mind in a New York minute. It’s literally impossible to take your eyes off the screen when she’s on it. And she has a really good rapport with Pierce Brosnan. I’d really like to see them do something else together, maybe a modern version of “The Thin Man” Brosnan goes through 90% of the movie unshaven and rather scruffy looking but I don’t think the ladies are going to mind one bit. Don Cheadle has fun with his role as a crime boss but he has way too little screen time. And his last scene is so abrupt and out-of-left field you may feel cheated by its resolution. So should you see AFTER THE SUNSET? It’s very difficult for me not to recommend this one. The main thing in its favor is that it’s thankfully unpretentious. It is what it is and that’s all it is. It’s not trying to be a Big Important Film or win any Academy Awards. It’s light, easy on the brain and the eye. The guys have Salma Hayek and Naomie Harris to drool over while the ladies can groove on Pierce Brosnan, Don Cheadle and Woody Harrelson. The locations and scenery are beautifully photographed and you feel like you’re catching a tan just looking at the movie. It’s an okay Late Friday Night movie to chill with the wife or girlfriend. AFTER THE SUNSET definitely isn’t going to make either of you feel like you wasted your time.